Are you a developer? How you ensure that all the codes and configurations are working properly? Of course through testing. Every developer has the role of building codes and testing them. 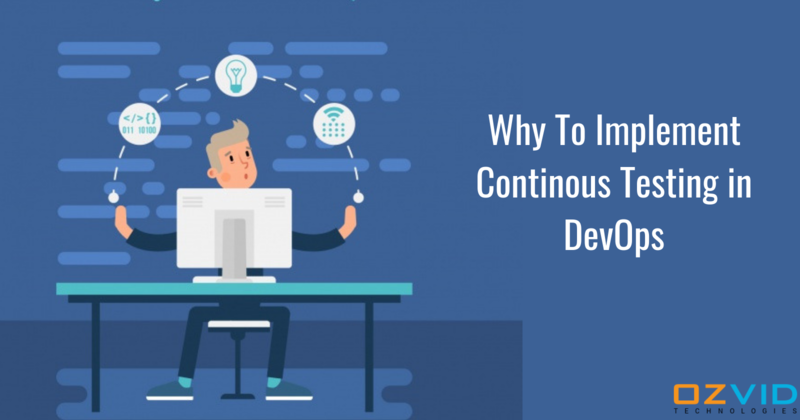 You have DevOps for this, Now you will wonder, what is In DevOps, DevOps is a set of practices that automates the processes between software development and IT teams, in order that they can build, test, and release software faster and more reliably. It is used for continuous testing is an end-to-end process that helps the team in maintaining the quality of work that the team performs. It includes a variety of automated test that is being conducted on a continuous basis. Continuous testing can be done at various stages like development stage, integration stage, staging environment, and production environment. Thus it helps the developers in fixing the errors as soon as possible, thus enhancing their productivity and saving their quality time. Proper Analysis Of The Risks: Continuous testing helps the developers in evaluating the risks that can stop the latest version of build for release by the business leaders. Help To Know The Security Issue: It helps in creating an effective support system that ensures that the application is safe from any kind of unexpected attacks. Thus with continuous testing, the developers ensure better stability and recovery of the system in case the software fails. Keep User Experience in Mind: The customer feedbacks help the developers in making regular updates in the application. This keeps the software more stable and robust. It also helps the developers in writing successful test reports by considering all aspects of the customer. Involves Functional and Nonfunctional Testing: Functional testing is a type of testing which verifies that each function of the software application operates in conformance with the requirement specification. This testing mainly involves black box testing, and it is not concerned about the source code of the application. Whereas Non-functional testing is a type of testing to check non-functional aspects (performance, usability, reliability, etc.) of a software application. It is explicitly designed to test the readiness of a system as per nonfunctional parameters which are never addressed by functional testing. Proper and Timely Response Towards Feedbacks: It helps in accessing every layer of software architecture, thus help in providing actionable feedback at the right stage of the delivery pipeline without creating any bottleneck. Saves Time: The continuous testing helps the developers in finding and fixing the bugs at an early stage, thus helps in saving the release window bandwidth. Doing this helped the developer team to reduce the resources and time invested by the team. Specification of Test At An Early Stage: For continuous testing of code at every stage of development it is essential to define test cases clearly at the beginning of the process. This prevents the development team from facing any kind of delay and wasting time. It is best to utilize tools like Acceptance test-driven development (ATDD), Behavior-Driven Development (BDD), and Model-Based Testing for building clear communication platform and in the understanding the requirement of the documentation. Improves Test Processes and Coverage: By knowing the testing requirements the development team is able to save a lot of time and resources. It can be done with the help of visual models. The model helps the team in analyzing various paths that need exploration and optimization for conducting the test. Take the shift-left testing and shift-right testing approach: Shift-left testing help developers to carry out testing in the initial phase of the development process. For this, the developers are provided by the developer-friendly tools that help in automating testing process, including performance testing, functional testing, security testing, and monitoring. The shift-right testing, on the other hand, is testing through production and post-production continuously including continuous monitoring of the process. Provides a complete test environment: To achieve continuous testing it is important to deliver the virtualized test environments. Offering the complete test environment help the developer team in removing blocks and in decreasing wait times for testing codes. Get the right test data: Most of the app release got delayed because of the availability of robust test data. In order to check the proper functioning of the test make sure that the test data is as close to the app will experience in production as possible.